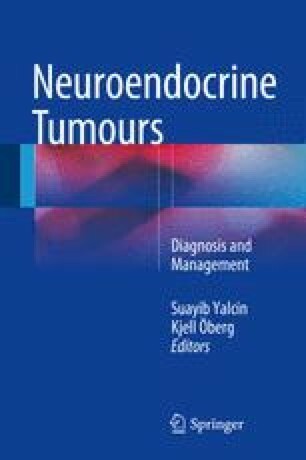 Neuroendocrime tumors (NETs) represent a group of neoplasms arising from the neuroendocrine cells of the diffuse endocrine system. The majority of gastrointestinal, pancreatic, lung, and thymic NET are sporadic. However, some of the NET may occur as part of multisystem autosomal dominant inherited genetic disorders, such as the MEN-1 syndrome, VHL, NF-1, and TSC. Over the last three decades, the genetic basis of tumorigenesis in the context of these familial syndromes has been elucidated, thus providing clinicians with useful screening tools for affected families.